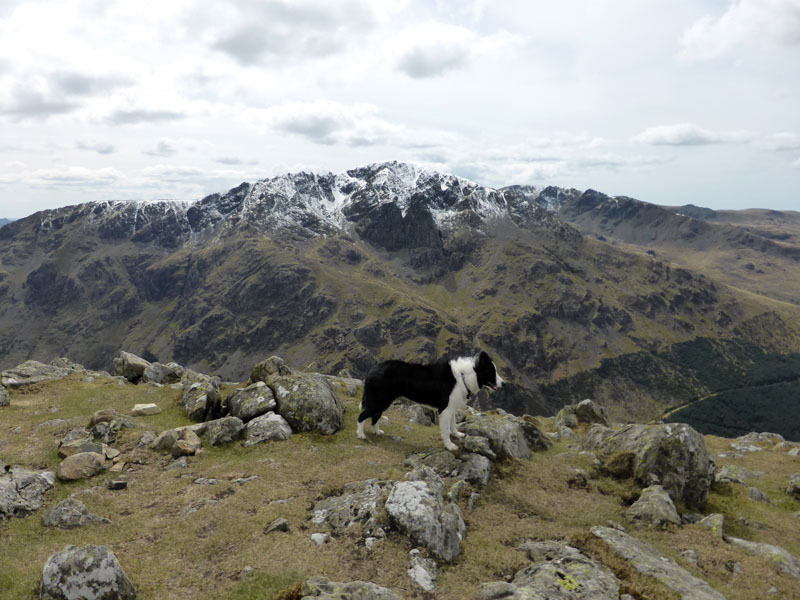 The Friday before the Bank Holiday weekend looked a good bet, so Molly and I headed for Cumbria and a walk upon one of the finest mountain ridges in Lakeland. 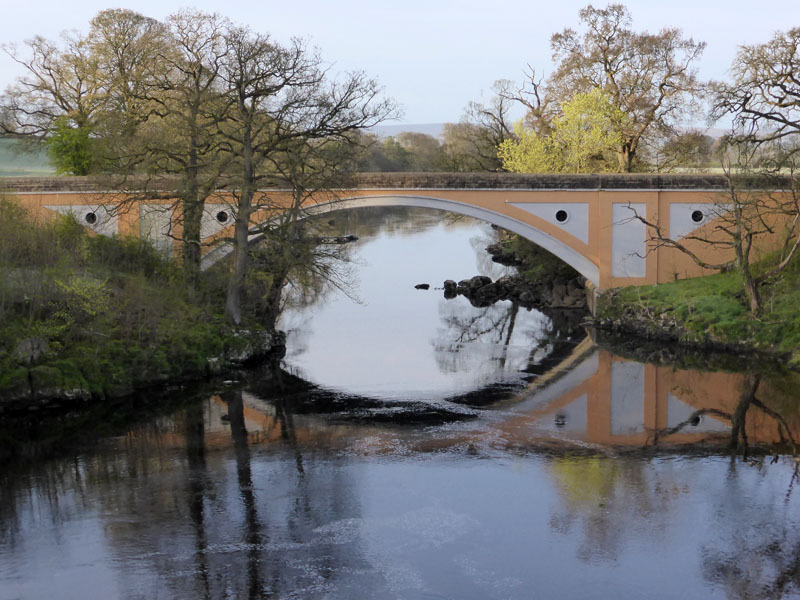 Leaving home at 05:45hrs, the journey up the A65 is generally an easy one at this time and today was no exception. 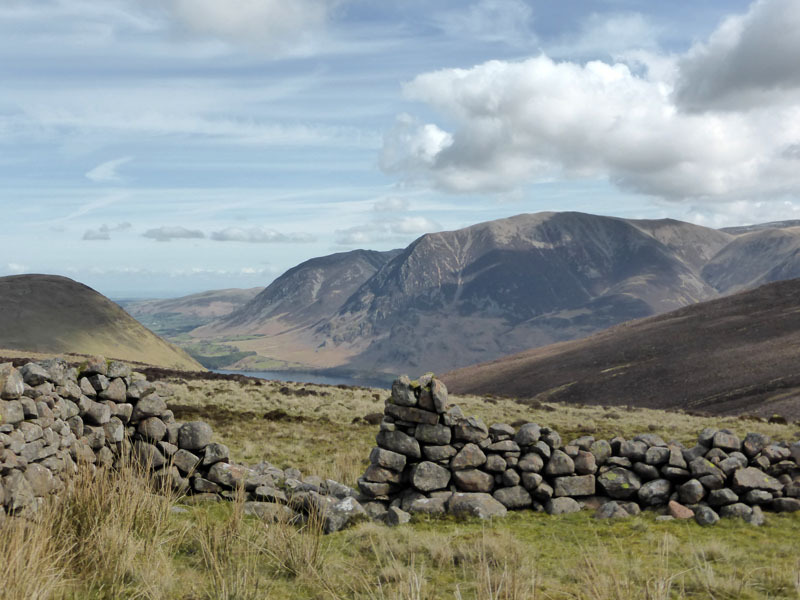 Does anyone remember The Goat Gap Inn? Times have changed and roadside refreshments are now quite scarce. I have a new toy, a "dashcam". So behave yourselves! 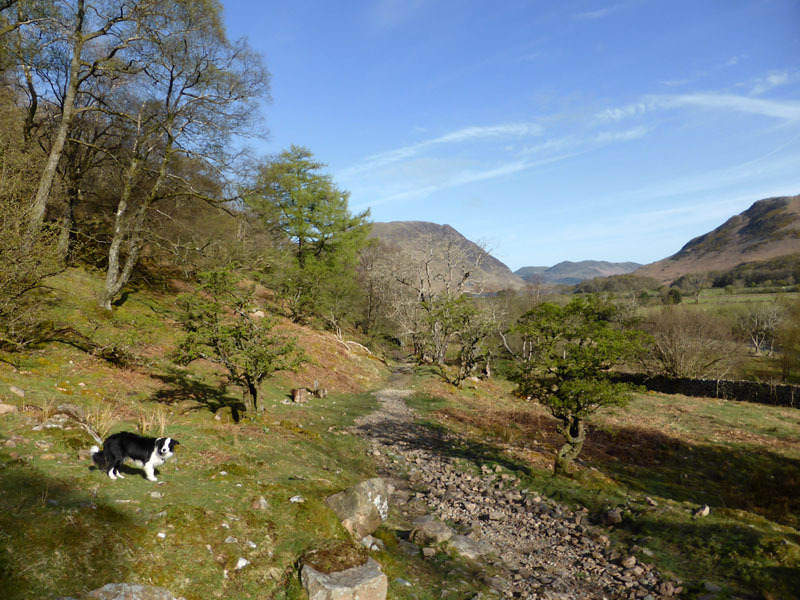 We're ready to walk by 08:30hrs in Buttermere after a short break by the River Lune in Kirkby Lonsdale. 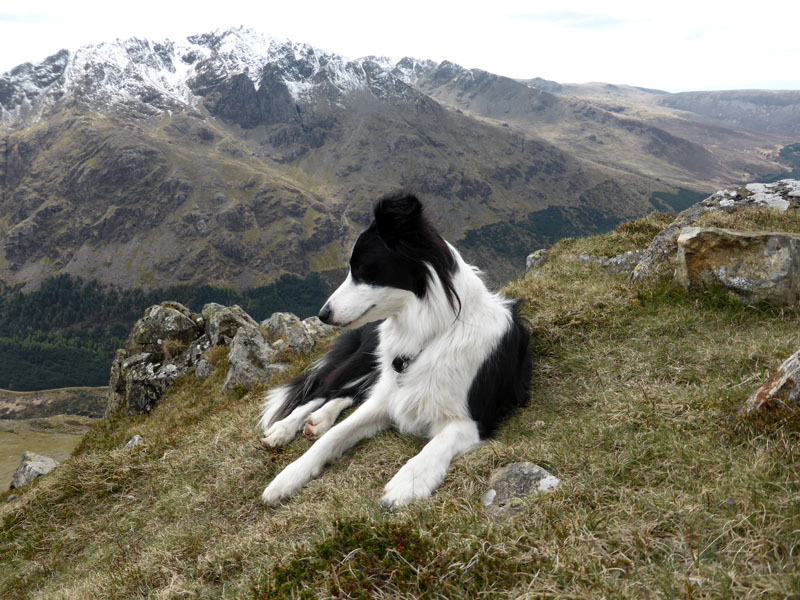 It's a bit further than I prefer to travel for a day trip, but, short of moving house the distance will remain as it is. 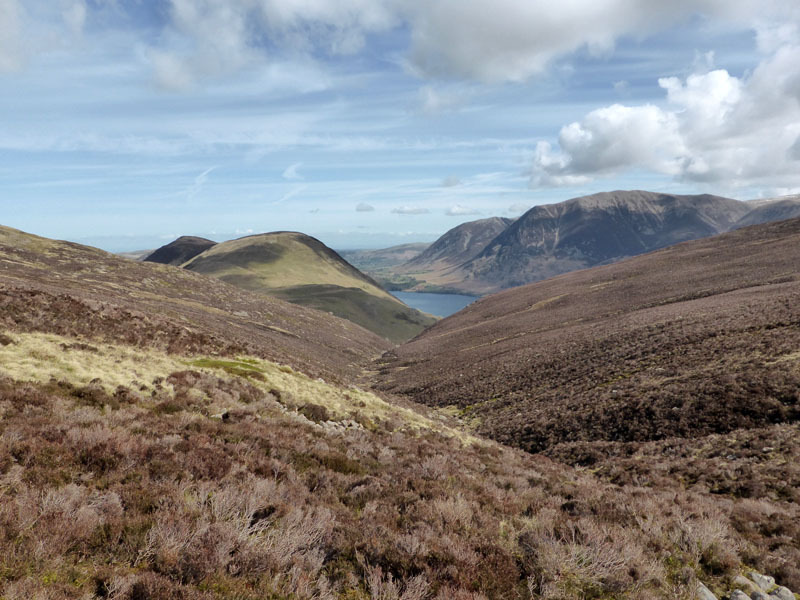 This walk has the peak of Starling Dodd as the initial target which will put us in position for a walk along the "High Stile Ridge". 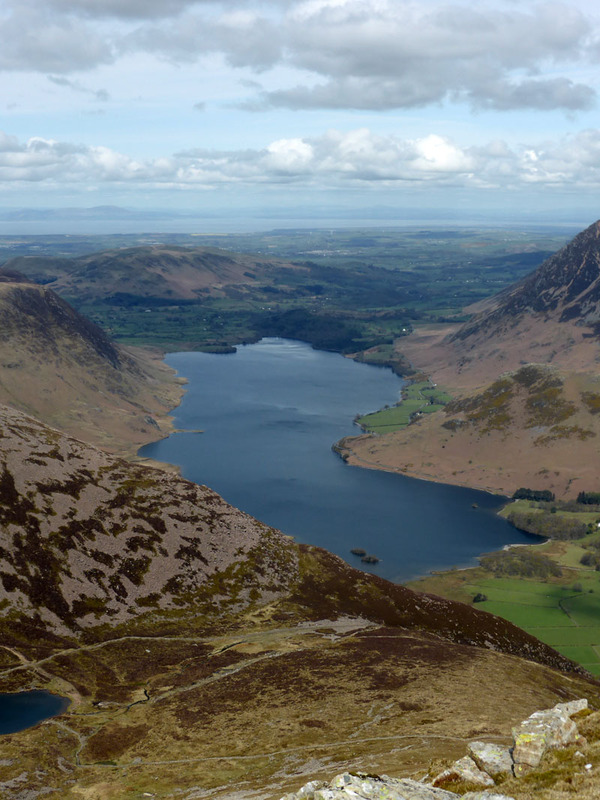 Wainwright offers an after-thought about ascending Starling Dodd from Buttermere "or..from the Force climb Scale Beck to its source and bear right". That's what we'll do then. 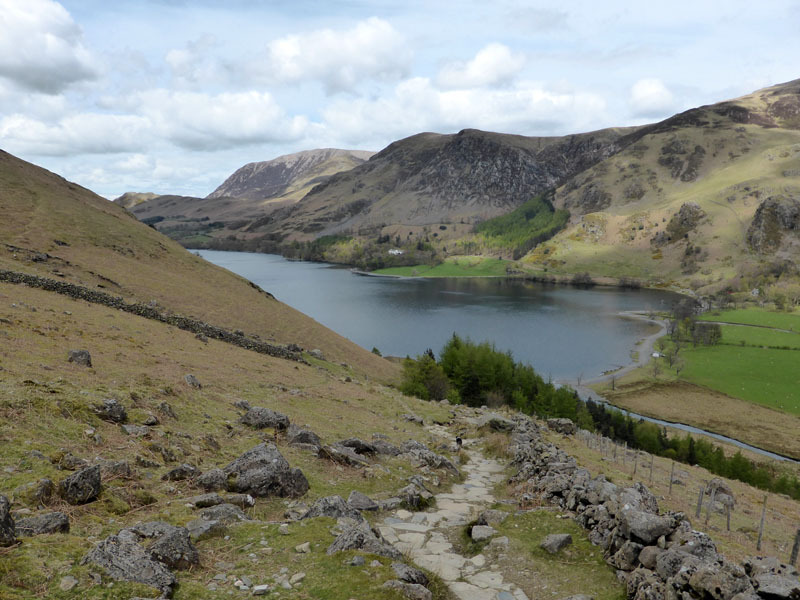 Rannerdale Knotts in the near ground on the other side of Crummuck Water with Grasmoor (l) and Whiteless Pike (r) further away. 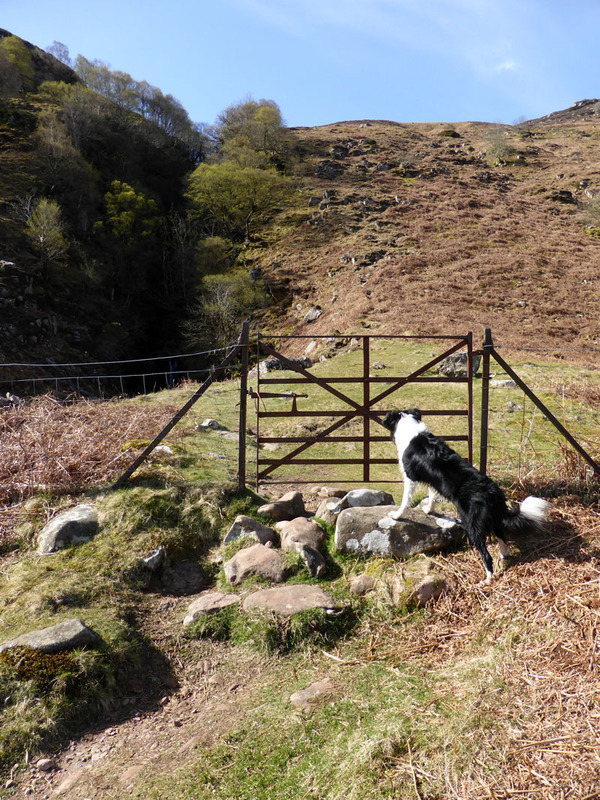 Scale Beck with Scale Knott and Molly fails to push the gate open but knows where she should be going. 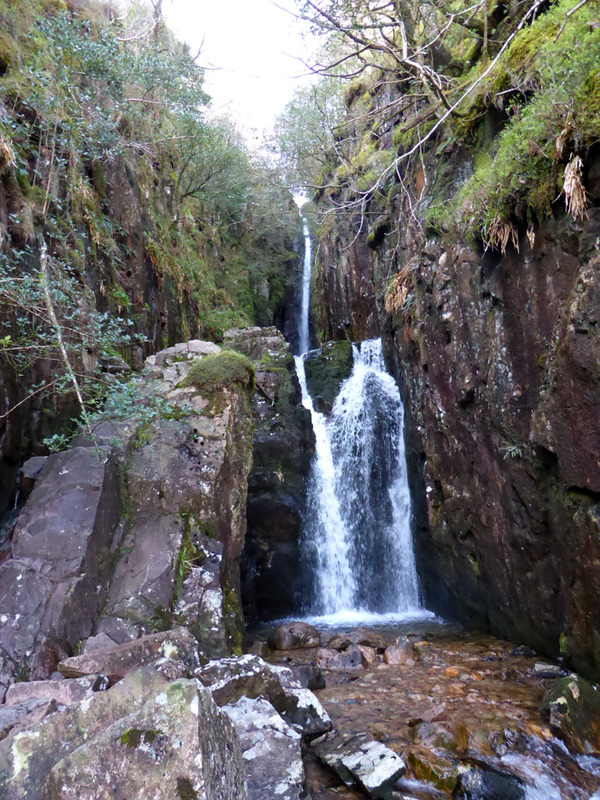 Lakeland's highest waterfall and the rules state quite clearly that you have to take a photograph of such if you're passing this way. 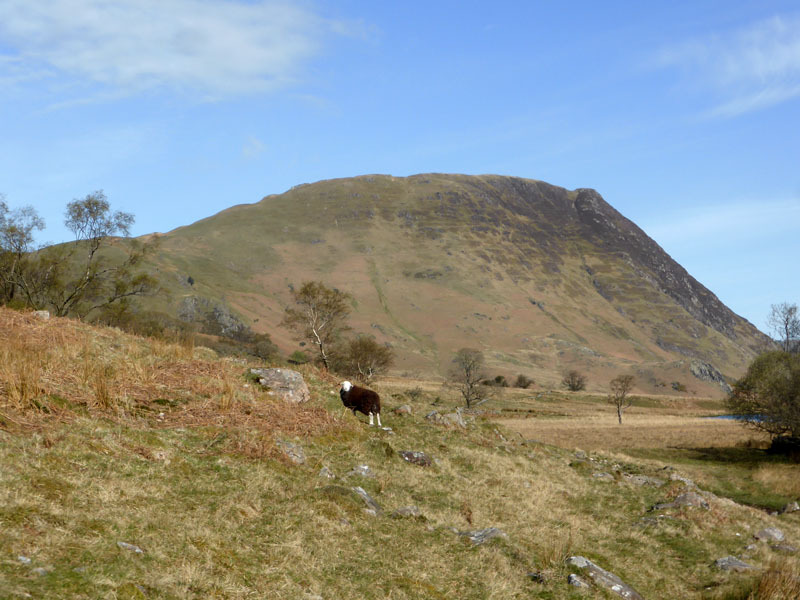 A look back at the sunny scene towards Grasmoor before tackling the unfeasibly steep path up by Scale Beck; layers come off at this stage. 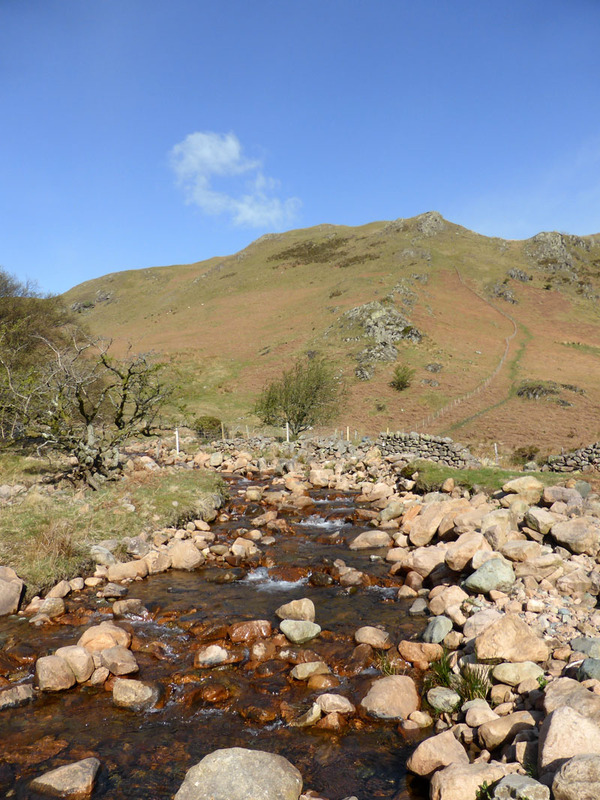 It's clear that not many folk walk to the head of Scale Beck, a feint path becomes feinter as height is gained. 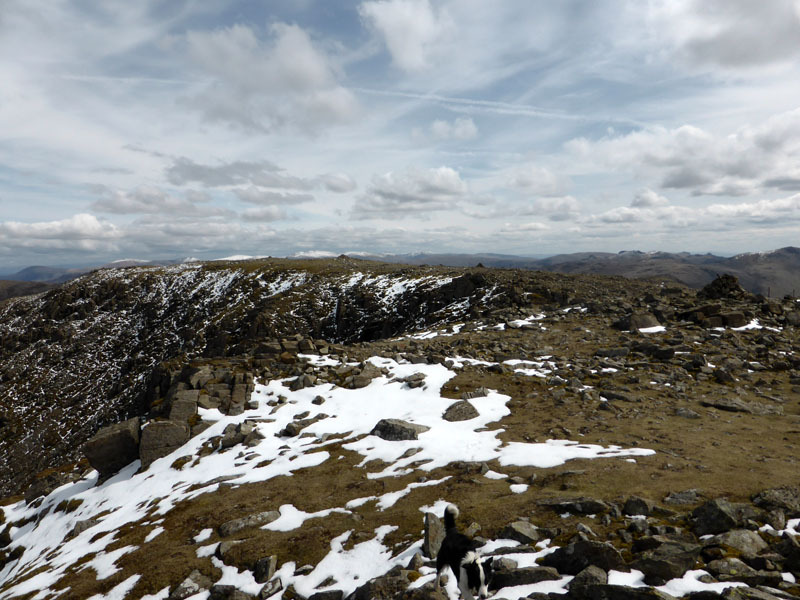 Upon reaching a sheepfold, which is marked on the map and using such as a point of referance, it's easy (in clear weather) to find a way to the higher reaches of Starling Dodd. 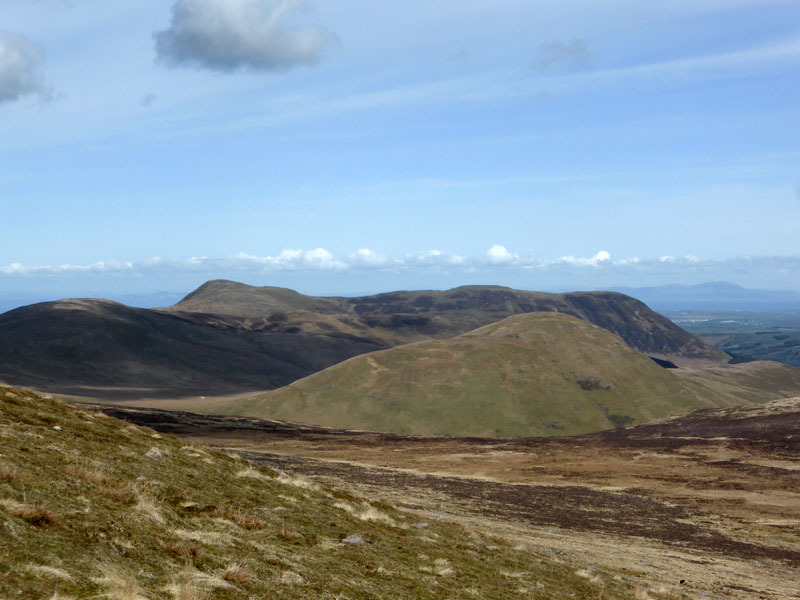 The grassy hill is Hen Comb, the fells further away include a highpoint of Blake Fell. A pile of rubbish on the roadside in your town is condemned as fly-tipping. 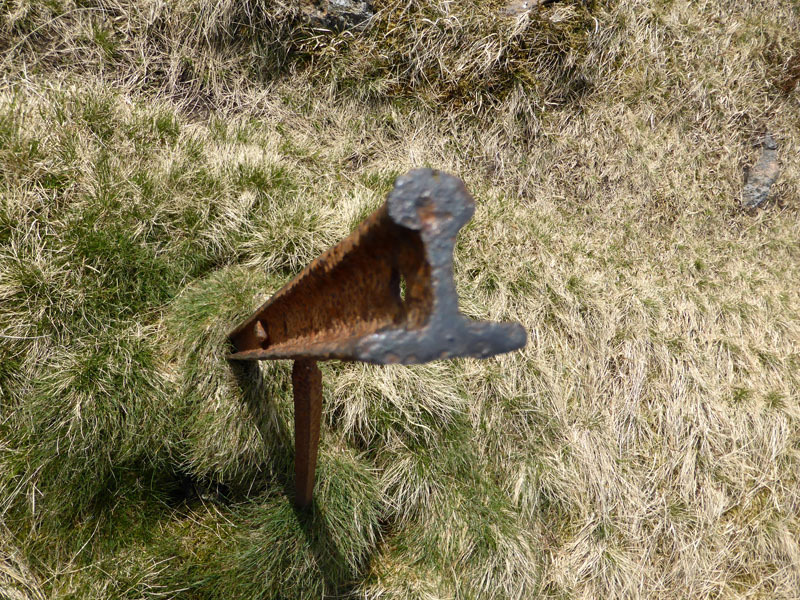 Here, the scraps of an old fence are instantly recognisable to folk who know their felltops. Strange how this untidiness has become acceptable. 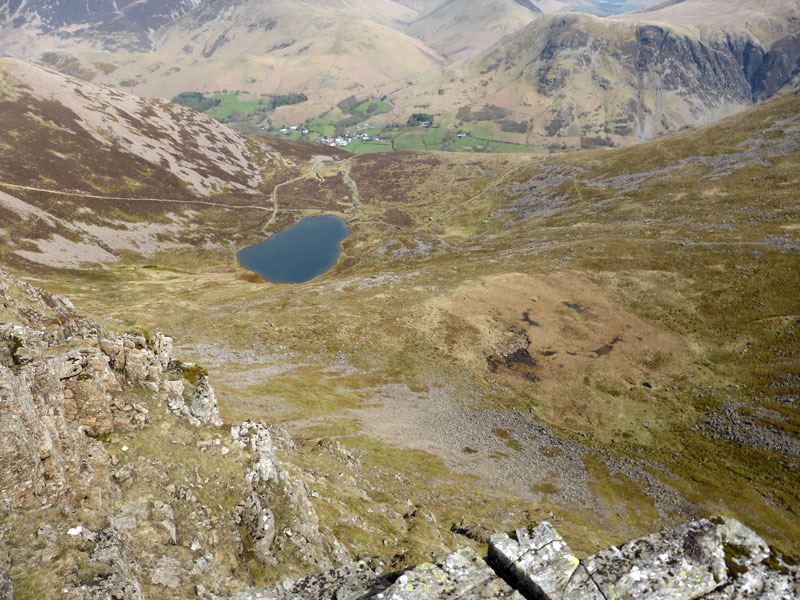 On the ridge route to Red Pike there is a depression with the remnants of a small tarn in what AW describes as a "curious hollow". You can see how the pool is silting up and vegetation is taking hold. 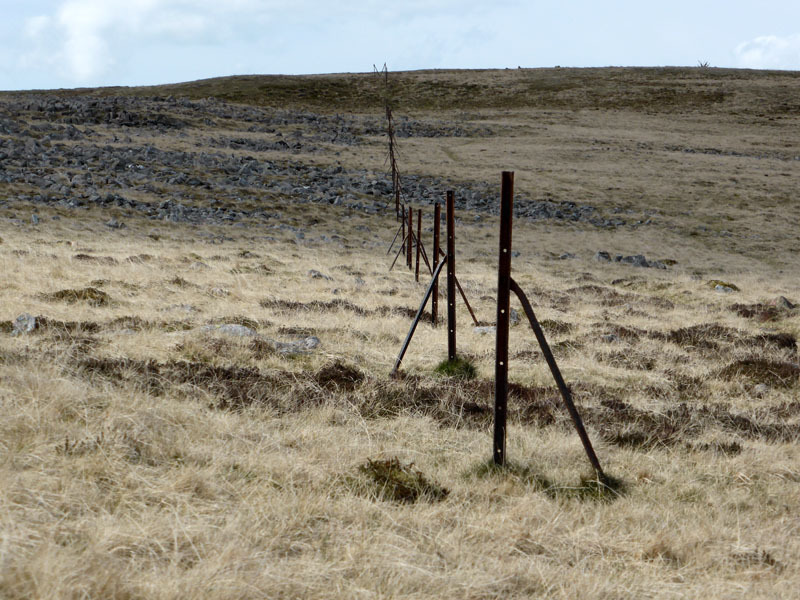 The iron posts tell a story of where a fence used to be and upon closer inspection, I'm left wondering if the upright supports are cut from the same metal as the local miners' rails? 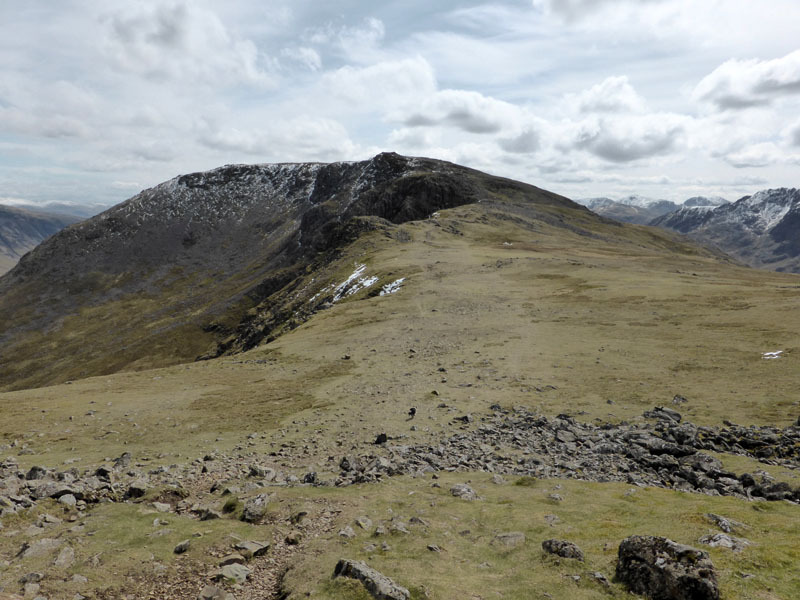 On the ascent to Red Pike, we join the ascent route up Lingcomb Edge. 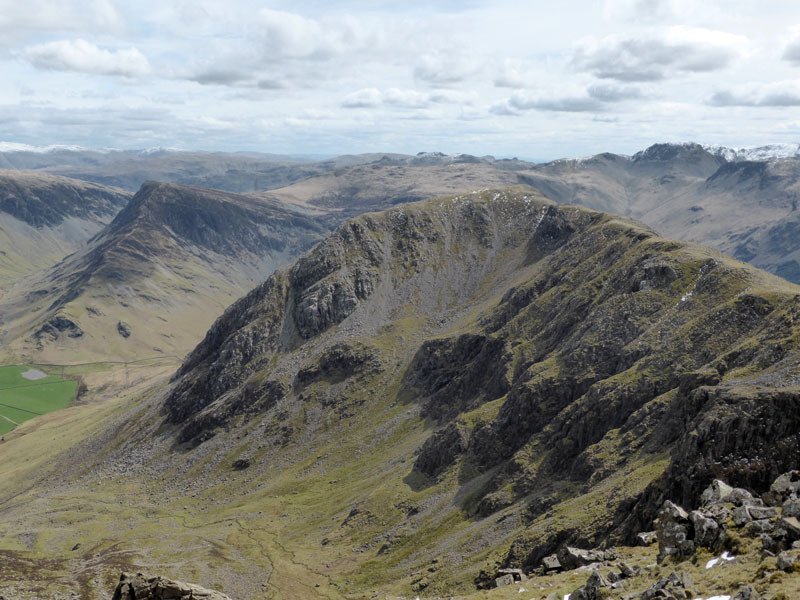 This is just what fellwalkers come looking for, high and craggy territory with fine views all around. 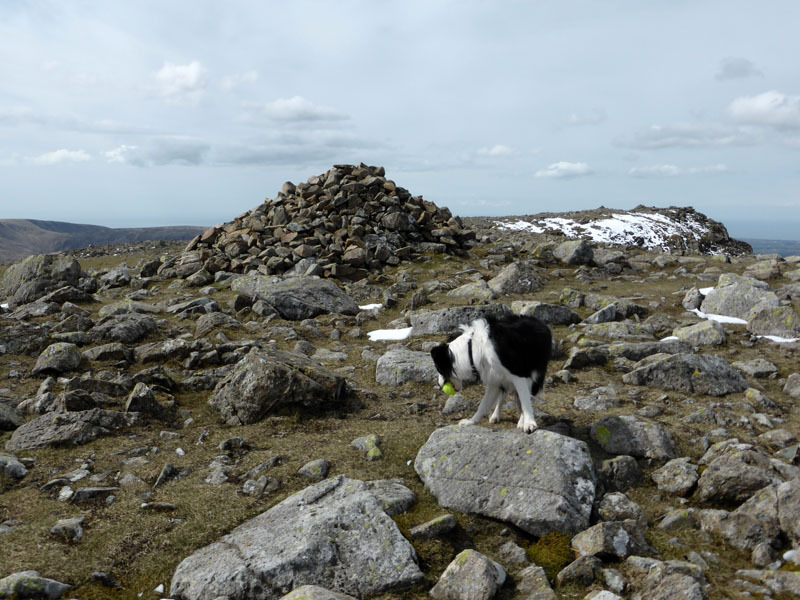 High Stile has a good number of cairns and you can take your pick as to which one is the summit. 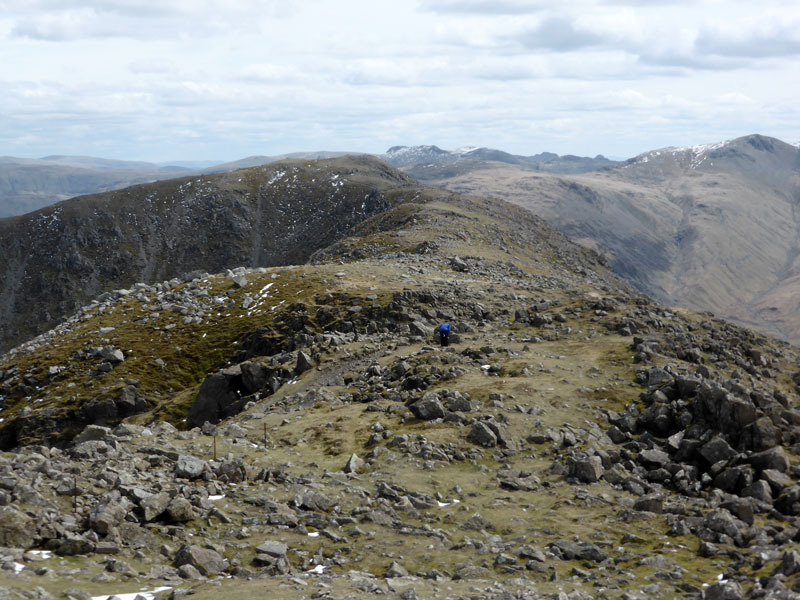 The OS maps show heights based on aerial surveys, do they take account of man-made piles of stones? 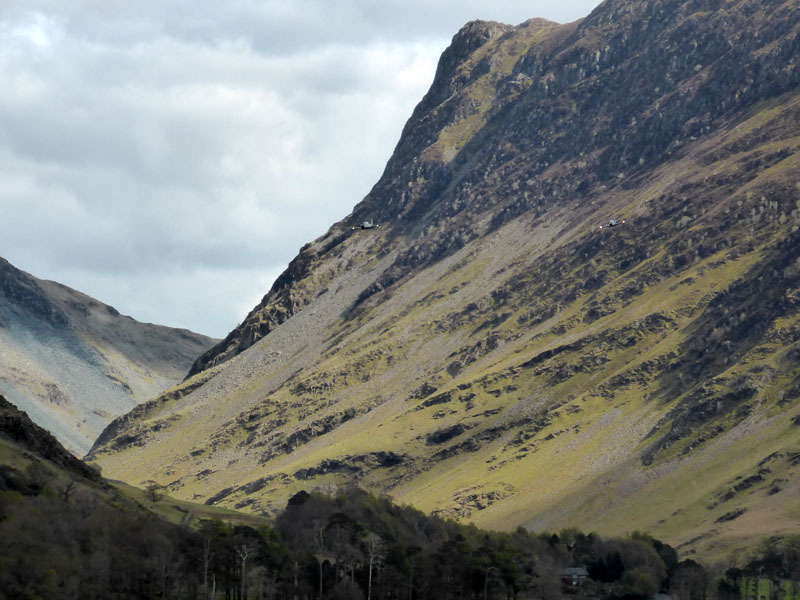 The two points are just 1m different on the map. 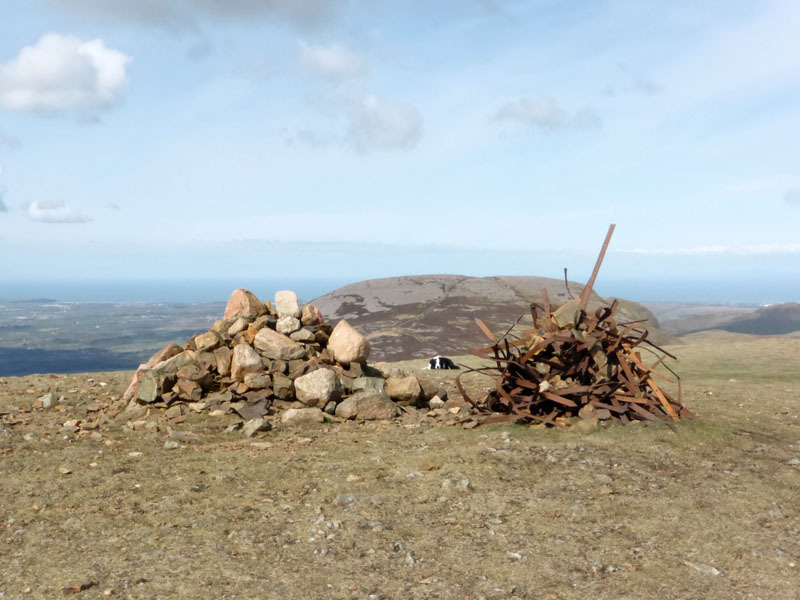 The highest point according to the OS is the cairn in the middle distance, but who cares? It's always a pleasure to be up here. 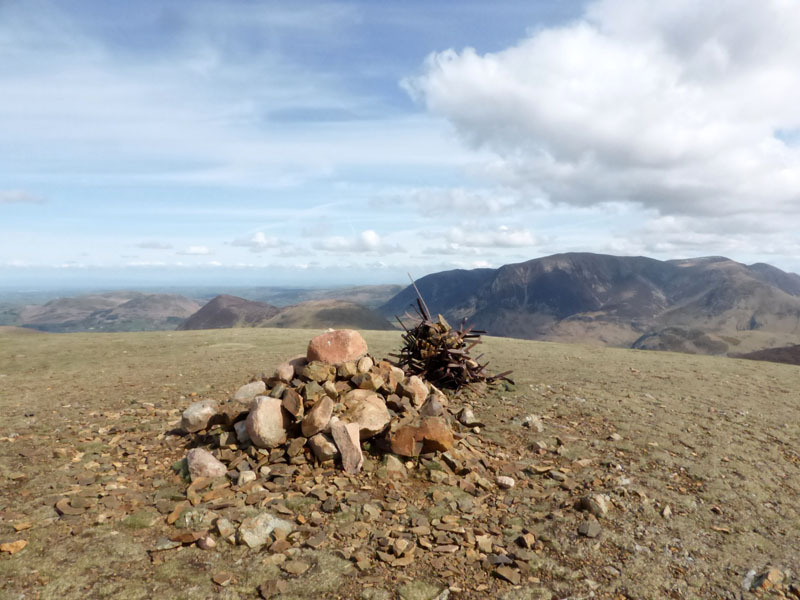 When I was younger and walked with my dad, we had a custom to pick up a stone on the ascent and then place them on the summit cairn. I don't bother doing that anymore, perhaps I should take a few back down again! 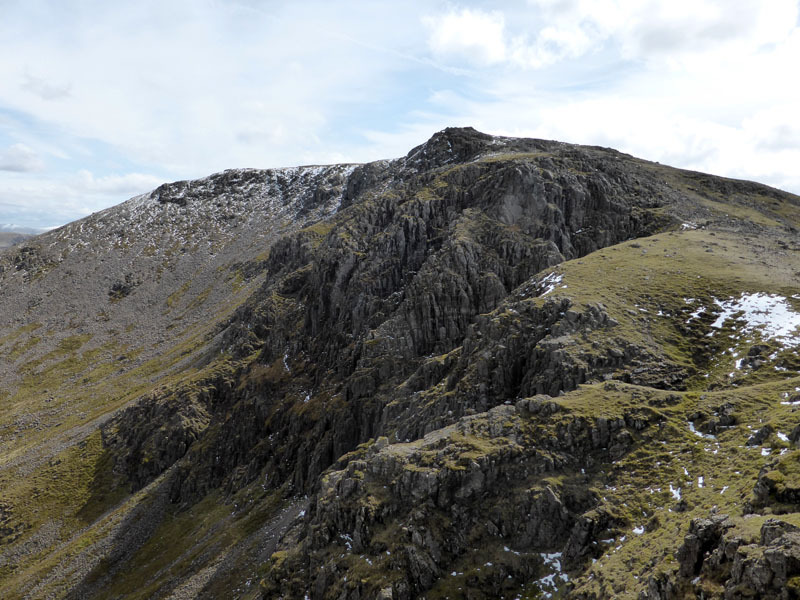 The next, and last, stop on this ridge walk will be the summit of High Crag. Far ahead of us I could hear two young ladies stood and chatting. Five minutes after passing them, I looked back and they were still in the same spot deep in their conversation. Only .... certain folk can do this! No 'isms allowed on here! 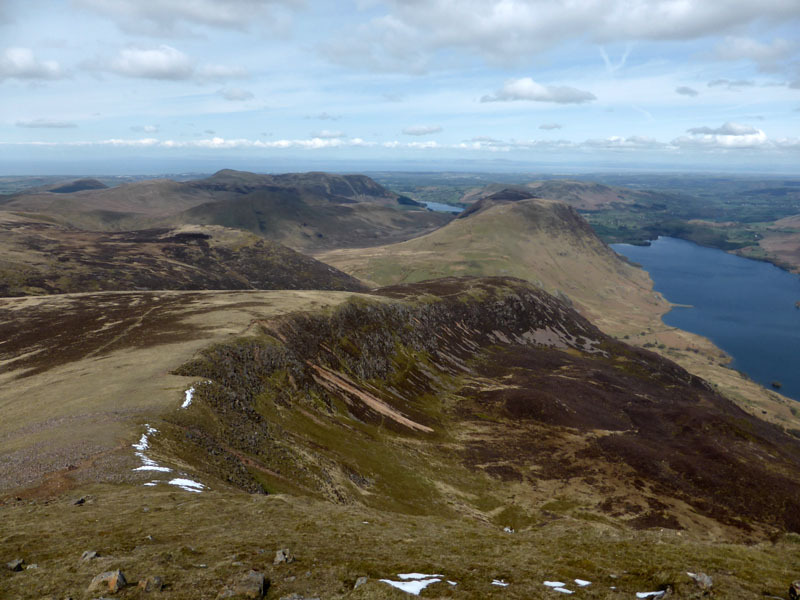 One mile of fine walking, giants all around with Pillar to the right and North-Western Fells to the left. 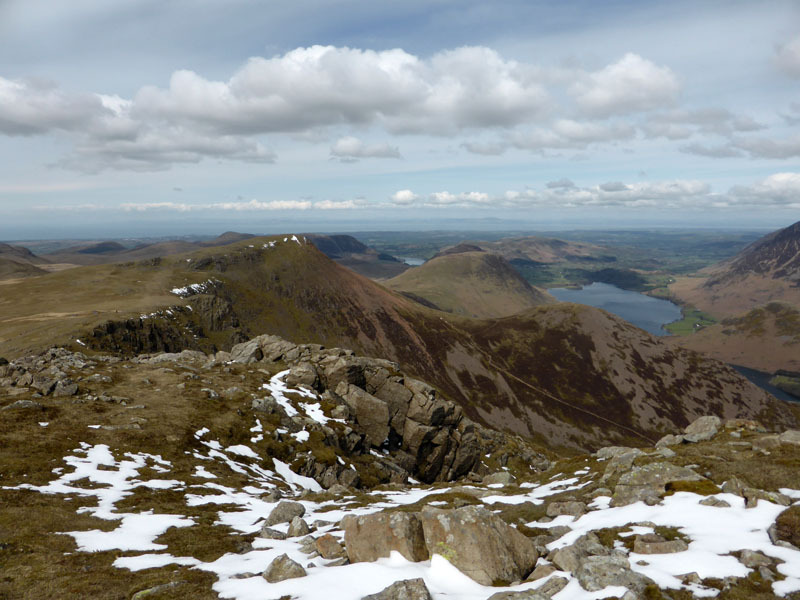 Pillar is snow-capped and Ennerdale can be seen to the west. 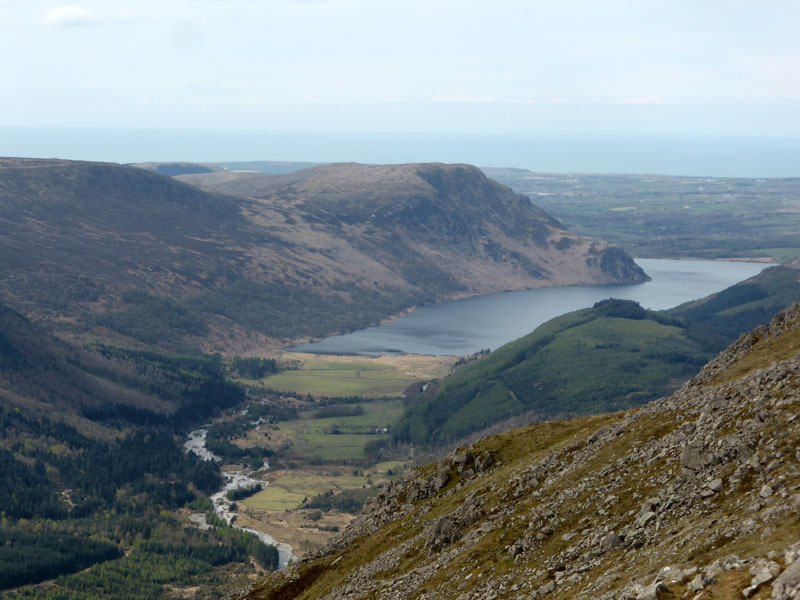 If you are in the area and don't fancy a climb, take a walk around Ennerdale Water. 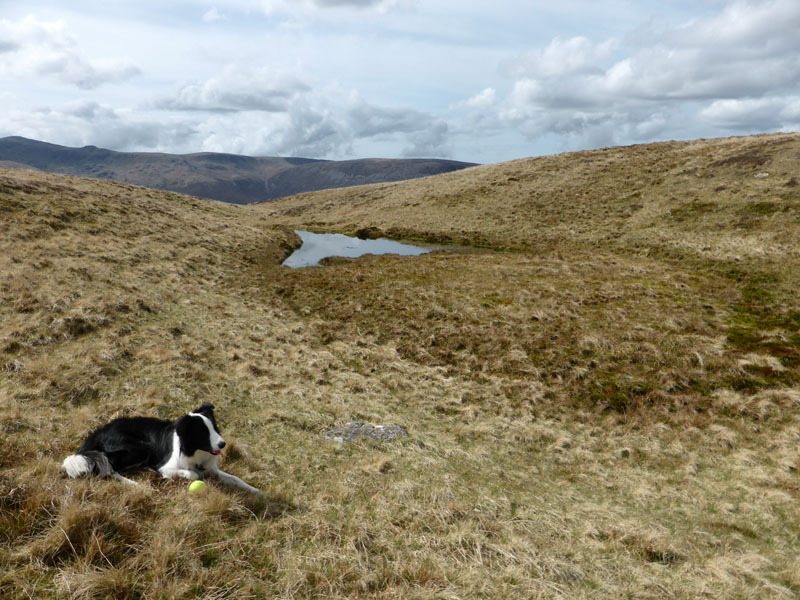 Allow three hours, or so and take light refreshments as there are no cafes or tuck shops. "Molly, we're going to have five minutes" said I "OK" she replied. 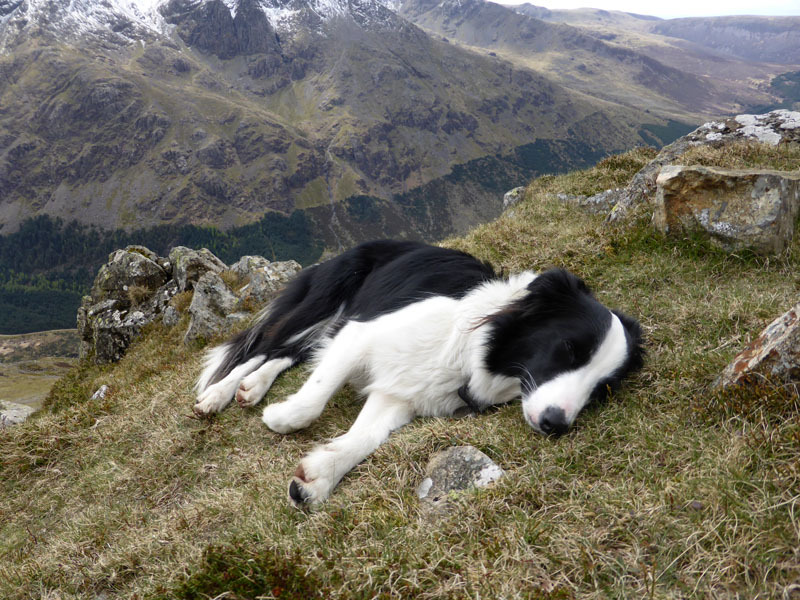 That's the first time she has had a nap on the fells, her feet twitching as doggie dreams took her to who knows where? 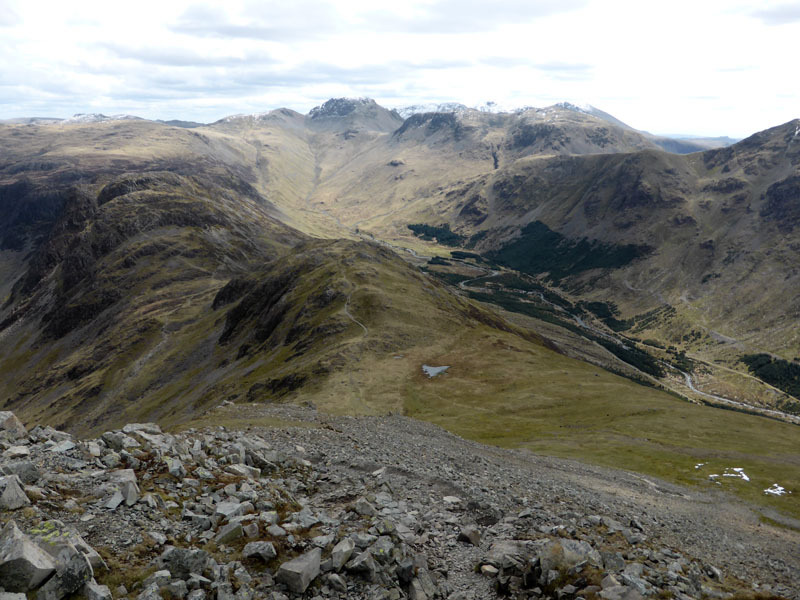 The steep descent reminds me of my first time up here when dad took us down this way - By Jove! that was tough going. 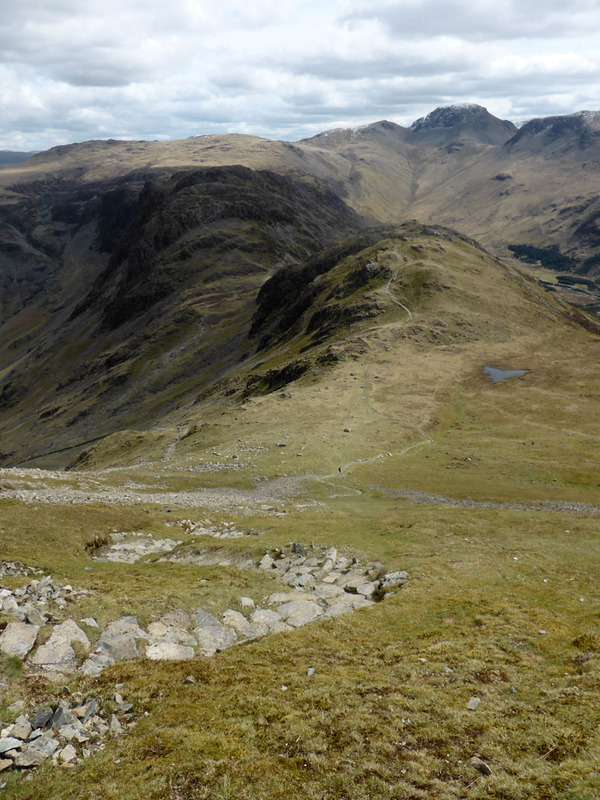 Less so today as part of the descent is pitched into a path of steps. 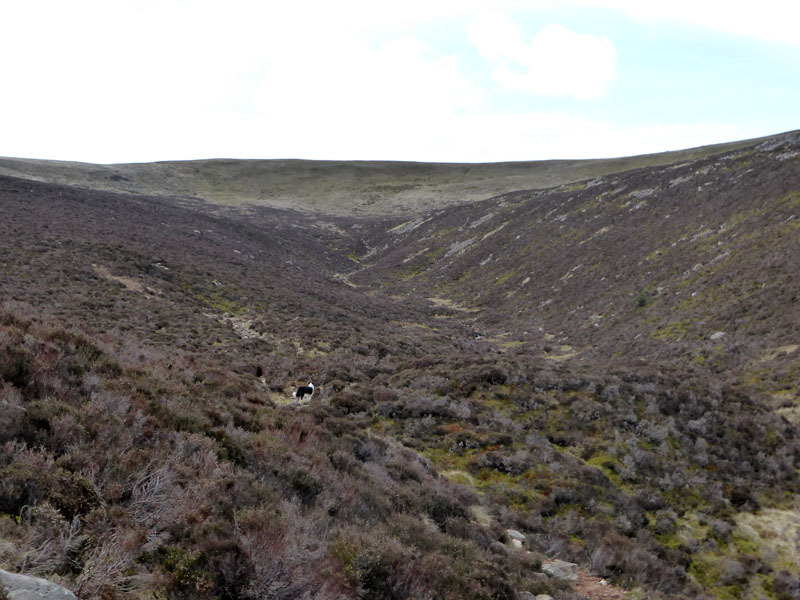 I reckon I've been up twice and down three times - it's steeper than it looks. 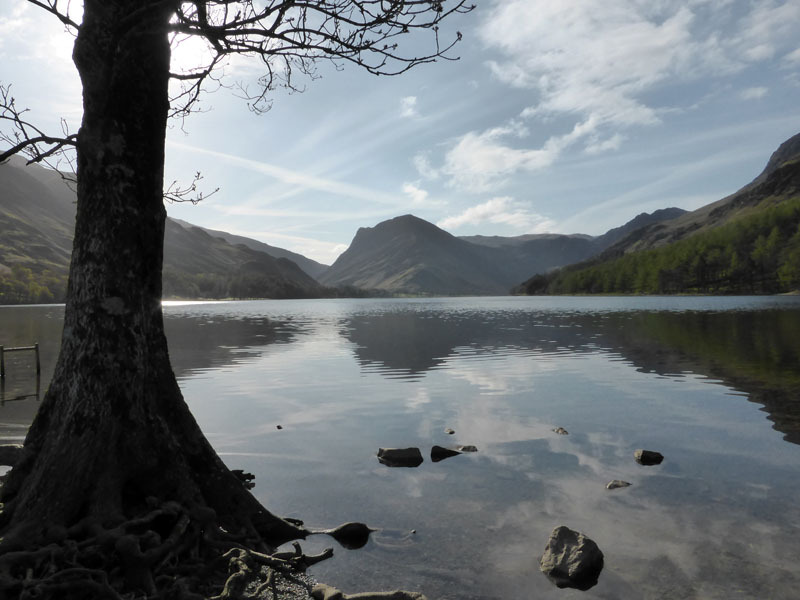 If you are heading for Buttermere, as we are, do yourselves a favour and turn left at the small tarn and take the rough path by an old wall and join the Scarth Gap route. 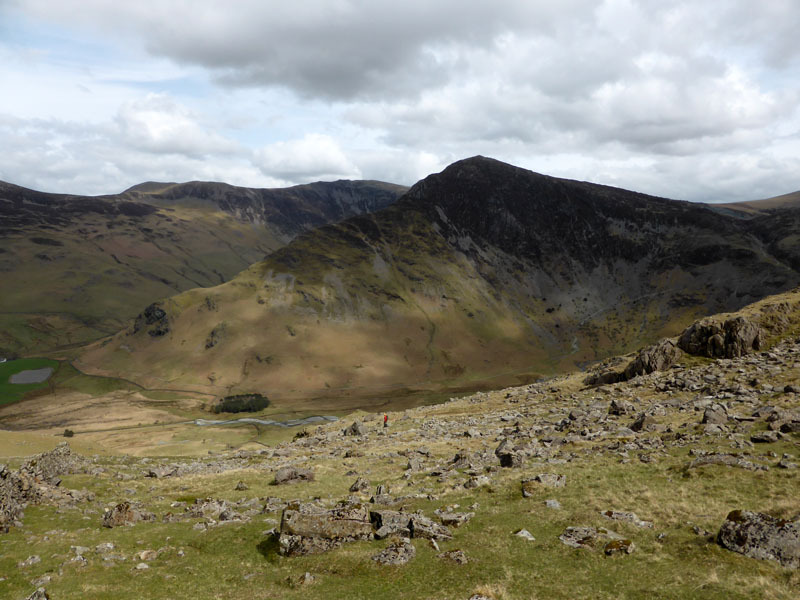 The bump ahead is called "Seat" and those heading for Scarth Gap or Haystacks (ahead) should continue over Seat. 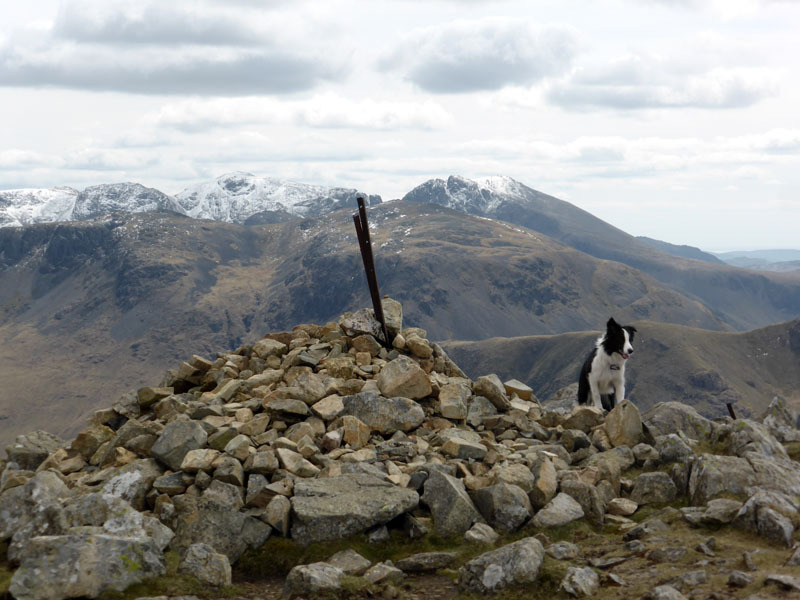 Great Gable is the high point on the horizon. 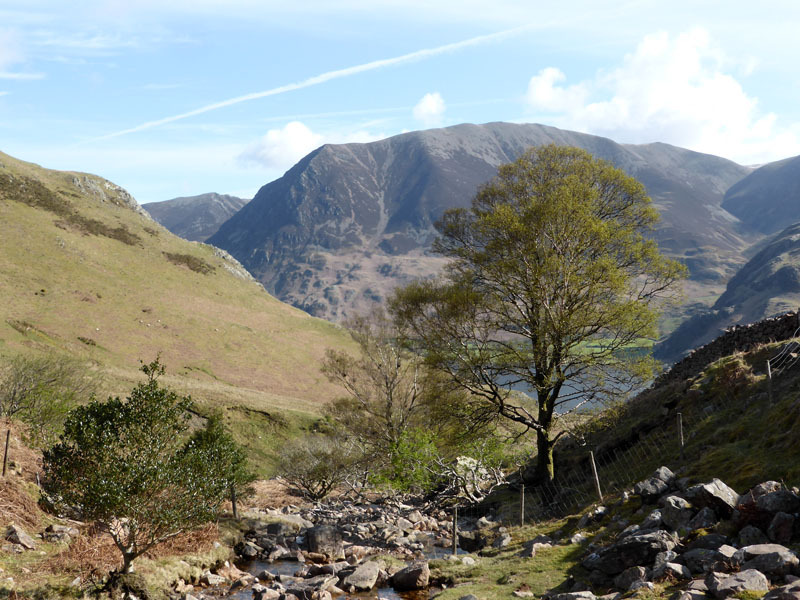 On the way to the main footpath, a little sunshine catches the foot of Fleetwith Pike. 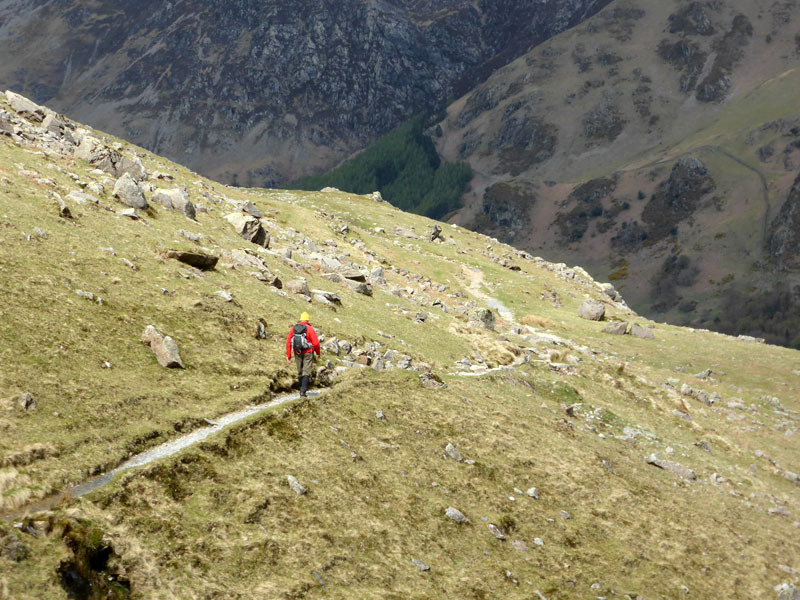 Steady descent to Buttermere and the shoreline path back to the village. 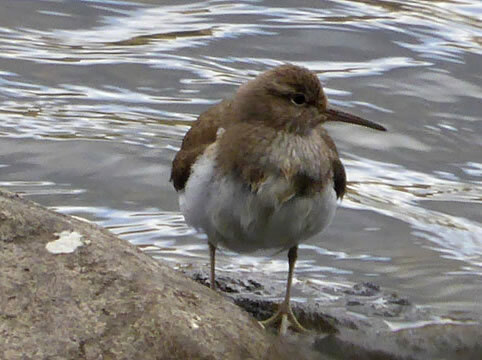 These noisy birds were busy at the water's edge; they have a part of the shoreline to themselves at the north end of the lake, with walkers diverted away. Two military aircraft are heading this way. 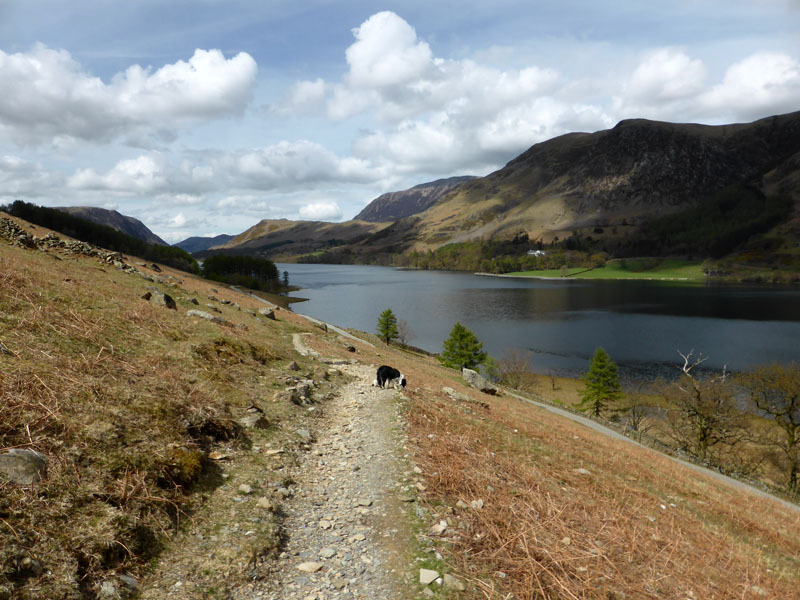 A splendid walk! Time taken: 7hrs 20mins over a distance of about 11 miles. 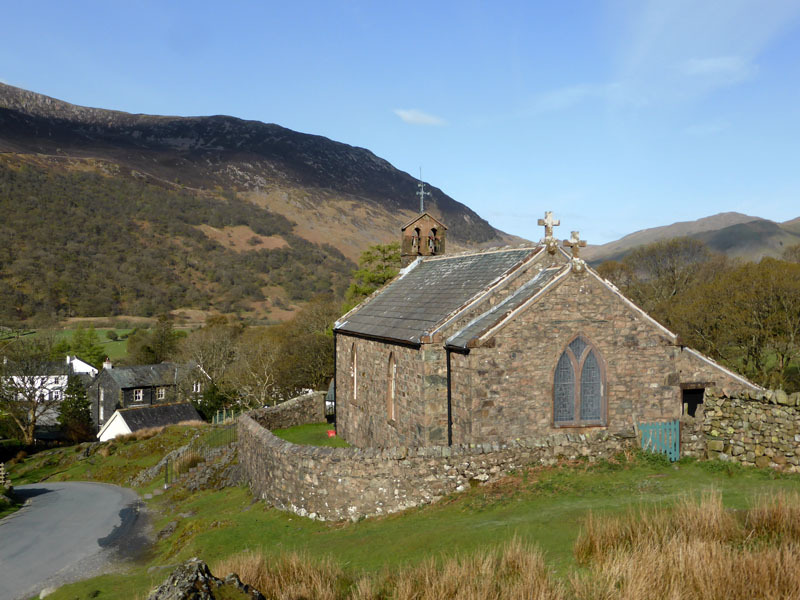 Route: Buttermere Church, shoreline path to Scale Force, up the beck path and then followed the beck to the top, sheepfold, Starling Dodd, Lincomb Edge, Red Pike, High Stile, High Crag, Gamlin End, tarn and rough path to join the Scarth Gap track, down to Buttermere lake and the shorline path to the village. 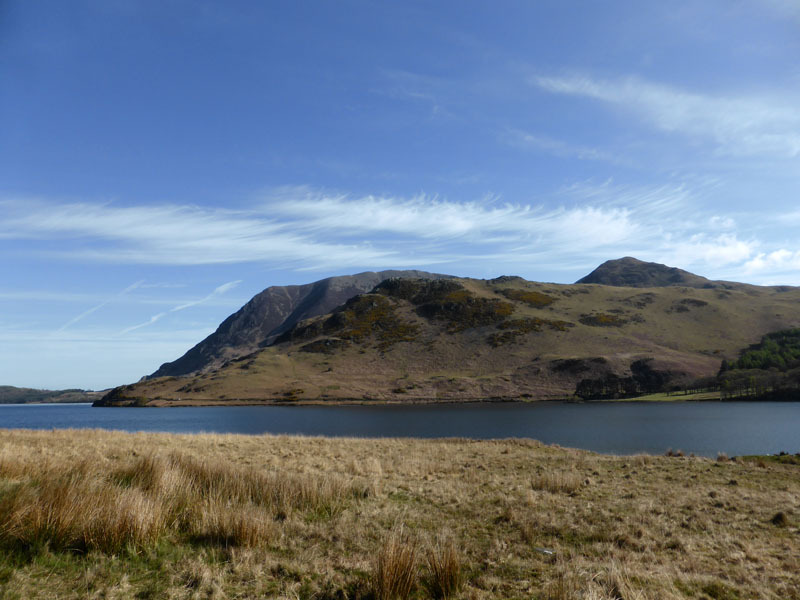 Weather: Coolish, sunny to start with then clouding over for a while. 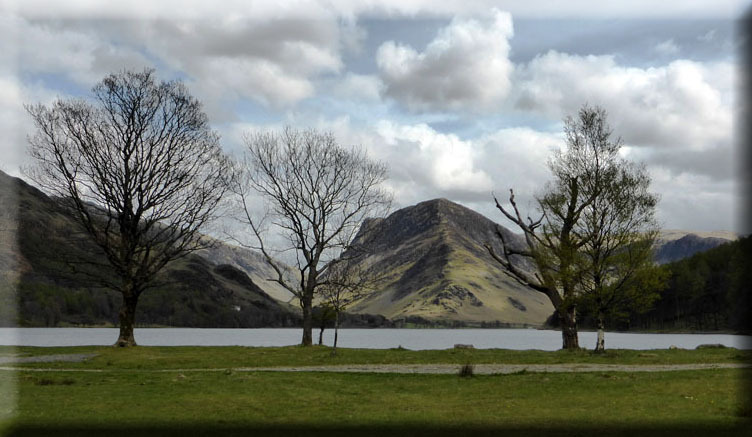 Refreshments: Coffee and Tiffin at Syke Farm Tearoom. "No dogs allowed" - maybe "Sorry, no dogs allowed inside" would look better. Strange lack of a welcome, rather odd atmosphere inside. There was a short impasse and a look of disappointment as I didn't have the 10p to make the £4.10, why not just let me off this time and offer a smile?? Back to Croft House Farm next time, just thought I'd try the other one.